One of the ways in which interior designers achieve texture in a room is to create a space with all walls but one being smooth. In a living room, this is usually accomplished with one large wall being finished with natural stone veneer which can be chosen in a wide array of colors and shades. Imagine that same wall with curios built into the wall for added effect and extra layers of texture. 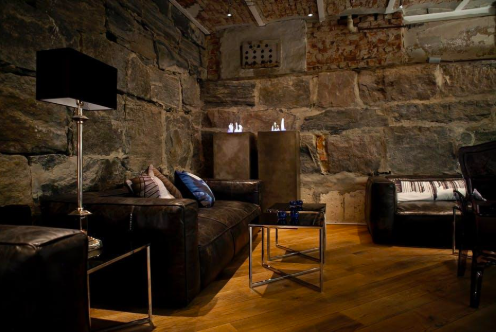 With ambient lighting and natural stone, you can create a room that exudes luxury and elegance. Many new homes are designed with ‘indoor’ spas. This term is used loosely because the room itself isn’t exactly part of the interior of the home. Rather, it is built in much the same location as a patio or a sunroom would be located but it is often on a corner or jutting out with three sides exposed. The use of building stone halfway up with large windows to bring in natural light adds to the overall appeal. Natural stone is used on the floor and often a sauna is placed centrally in the room with sofas and comfortable chairs placed along one or more walls. This isn’t your traditional spa, but rather a place to relax away from all the noise, confusion and stress of everyday life. Using natural stone for planters along an exterior wall with other aggregates used in hardscaping designs brings to mind those homes you would only see in Better Homes and Gardens or in homes highlighted in Lifestyles of the Rich and Famous. Take a few moments to think about the homes of celebrities like Ellen Pompeo’s Mediterranean style villa in Los Angeles. You can see the use of natural stone carried throughout the entire entryway garden. From the stone planter in the center of the walkway to the natural stone pavers and steps, the effect is stunning. Whether you choose to incorporate natural stone throughout both the interior and exterior of your home or choose a few special focal points to highlight the elegance, there is nothing quite as awe-inspiring. Having said that, the one thing you may want to do is hire a professional stone mason if the design is to be intricate. Some DIY projects can be completed easily, but for the most amazing results, always hire a pro. The finished product will be well worth the cost!